Lloyd’s Register, which was founded in 1760 and is now one of the world’s leading professional services firms for engineering and technology, provides high quality public and bespoke training to prepare and upskill management teams, auditors and staff to meet the requirements of the new standard. This ebook provides a comprehensive overview of ISO 45001, the benefits it will bring and how to prepare for the changes. It also looks at Lloyd’s Register’s gap analysis, which assesses an organisation’s occupational health and safety management system, its readiness for the new standard and plans for migration. Lloyd’s Register offers a range of courses covering all aspects of ISO 45001, from one-day workshops on the extent and nature of the changes being introduced to preparing for migration and adapting internal and lead auditor processes. In addition, it offers in-depth courses for those new to occupational health and safety management systems who are looking to implement ISO 45001 for the first time. 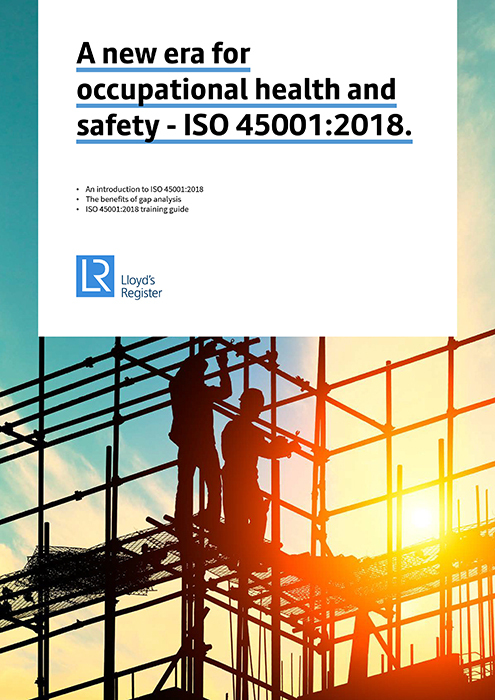 Lloyd’s Register runs ISO 45001 courses the length and breadth of the country throughout the year, and all of its public training courses can be delivered in-house to maximise organisations’ training budgets.